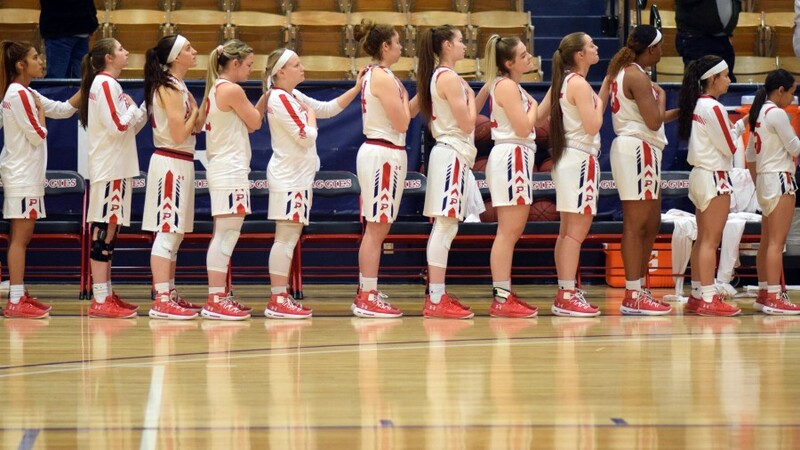 Goodwell, Okla.—The Panhandle State women's basketball team sits at .500 on the season (8-8) after suffering a Sooner Athletic Conference loss (75-44) to John Brown University Thursday evening at Anchor D Arena. The Golden Eagles received votes in the NAIA Basketball Coaches Top-25 Poll this week and lived up to the recognition, taking their 13th win of the season over the Aggies and owning the third spot in SAC standings with an 8-2 conference record. JBU averaged 47.5 percent in shooting and held Panhandle to under 25 percent from the field for the night. The Aggies took a majority of their shots from three-point territory, but connected on just four of 34 attempts beyond the arc. Senior Taylor Acosta led the team in scoring with 13 points followed by junior Nadia Hayes who posted nine points for Panhandle. Addison Munsch and Monti Regier finished with seven and six points respectively. The Golden Eagles overpowered the Aggies 52-23 at the boards and outscored their opponents 40-20 in the paint. Senior Hannah Faulks held the team-high in rebounds with seven, and Munsch made away with five. Off the bench, Kaylee Morgan matched the game-high of four assists with JBU's Sara Williams. Head Coach Victor Esparza stated plainly, "We let frustration get to us tonight. I thought we played hard for the whole game, but just had trouble scoring. It was a tough game for us, but we will get back to work and try to get better." The Aggies own a 4-6 conference record as they go up against an 0-10 Bacone College on Saturday, Jan. 19. The Warriors sit 0-13 on the season and rank last in the league coming into Saturday's contest. Tip-off is set for 2 p.m. at Anchor D Arena with the men's game following at 4. Both games will offer live stats and video streaming links online at opsuaggies.com.